During one of her “house-sister” moment (you know, how you look when your in your comfy clothes and no makeup with your hair tied in the most messiest way possible) she runs into Izumi Miyamura, the known “quiet glasses boy” of the same class….the only problem is….unlike his school counterpart, he’s not your stereotypical nerd guy with glasses who you would think to be the genius of that. Miyamura is the exact opposite. Firstly, he is horrible in academic. Secondly, he basically look like a punk rock band member, with numerous amounts of tattoos and piercing in who knows how many places !! Now, Miyamura and Hori have someone to finally share their little secret with! But, will what started as just secret keeping lead them towards…mutual feelings? Artwork: Some might consider this manga to be pretty “simple”, no exotic details, grand scenery, and ehem….bulging if you know what I mean. Although that may apply to Horimiya, I think that the artwork perfectly fits how the author want to portray the storyline. It gives the manga a sort of not being simple but having “simplicity” not too dramatic as to discourage it’s readers but instead, to have then enjoy the sweet plot and adorable characters. 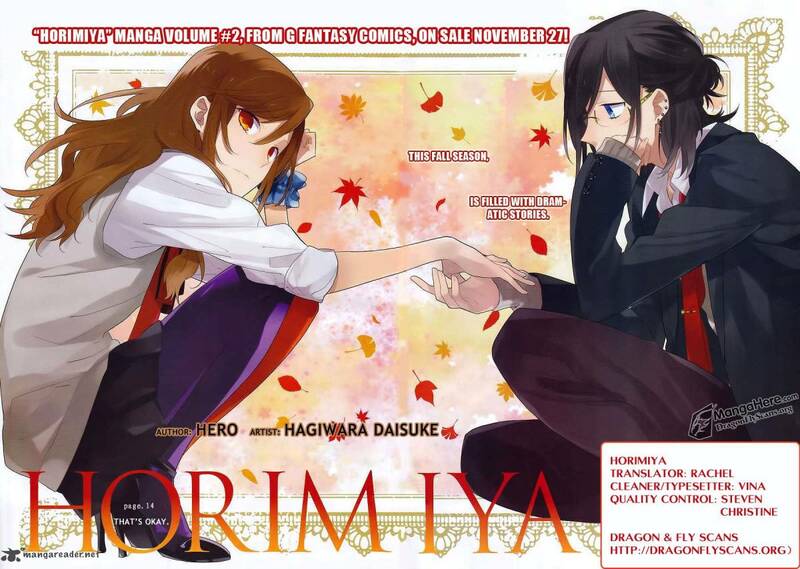 Now, Miyamura is drawn by an artist named Hagiwara Daisuke, and surprise surprise !! He is indeed a guy, and Horimiya is apparently a shounen manga. This could be because the manga is currently serialized in a shounen magazine, although I am not quite sure which one. Pretty cute love story for a shounen huh? Now if you haven’t read Horimiya yet, I considered you check it out NOW!! Don’t even consider it…just go !! Please feel free to leave any comments involving the manga and any other mangas you think I should check out! « My first ever blog, and post, and basically everything !! Oh yea! you’re definitely right!